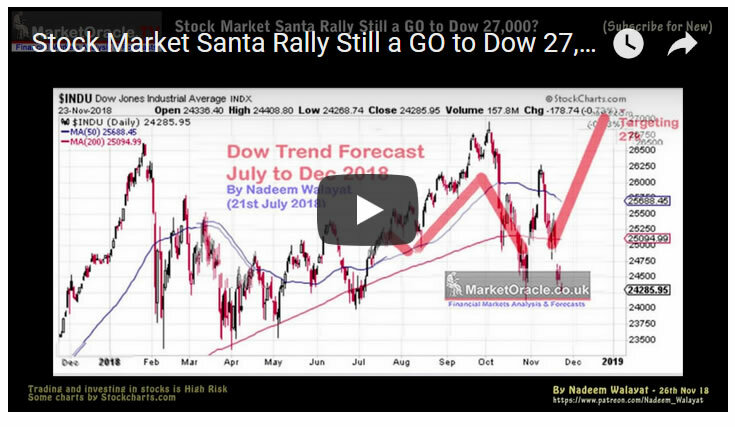 Stock Market Santa Rally Still a GO to Dow 27,000? Virtually immediately after I posted last weeks Dow trend forecast updatethat we were a GO for the Santa rally, the Dow decided to take a tumble by falling to a low for the week of 24,285 a sizeable 1100 point drop since my last update. So is the the Santa rally still a go or has fundamental damage been done for the prospects for a Santa rally? This analysis was first been made available to Patrons who support my work. So to get immediate First Access to ALL of my analysis and trend forecasts then do consider becoming a Patron by supporting my work for just $3 per month. https://www.patreon.com/Nadeem_Walayat.